YPSA and Federation of DPOs Sitakund organised a shearing meeting with the Sitakund Municipality on Disabled-friendly budget for the 2017-18 fiscal year of Sitakund Municipality. The meeting was held at the Sitakund Municipality hall room on 22 May 2017. 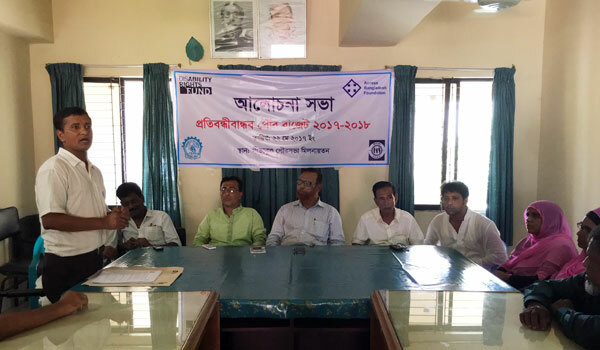 Mayor of Sitakund Municipality Bodiul Alam has presided the meeting. Councillors of Sitakund Municipality, Federation members and YPSA staffs were present in this meeting. Newaz Mahmud Coordinator of YPSA has facilitated the shearing meeting. Mayor and Councillors of Sitakund Municipality acknowledged that to allocate budget for the people with disabilities and provide education stipend to 4 students with disability in their municipality.